Sergey Dvortsevoy’s Ayka follows a young woman over five days bitterly cold days in a city she doesn’t really know. Attempting to flee from a terrible situation, but only finding an indifferent world and uncaring people, the Kazakhstani director has made one of Cannes 2018’s most formidable entries. Ayka (Samal Yeslyamova) is a 25-year-old new mother resting in hospital. Refusing to feed her baby, still bleeding from the trauma of giving birth, she gets out of bed, staggers to a window, opens it and climbs out into a Moscow blizzard. Trudging through the snow, blood seeping through her clothes, she seeks refuge in the underworld of undocumented migrant workers, trying to figure out her next move. Dvortsevoy last appeared at Cannes in 2008, where his fiction debut Tulpan competed in the Un Certain Regard strand. Ayka is his first movie in 10 years and the wait has been worth it. 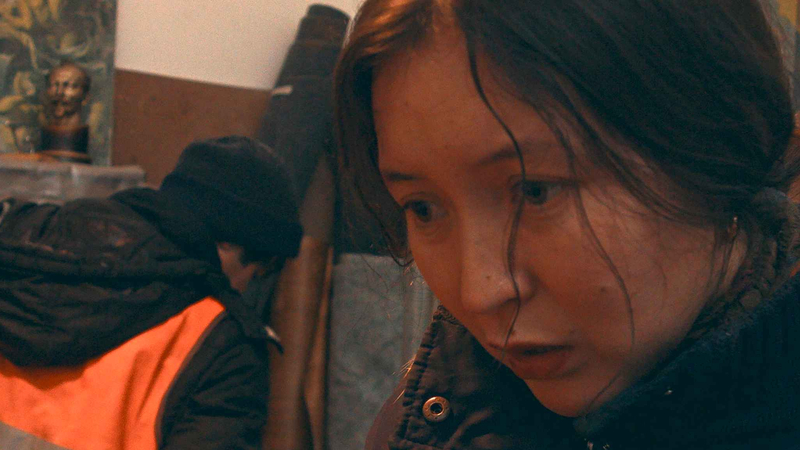 An extraordinarily nuanced character study, which drip feeds Ayka’s motivations for acting so seemingly cruel, Samal Yeslyamova delivers an unforgettable lead performance as the beleaguered protagonist. Set in Moscow during a fierce blizzard, Ayka is desperate for work and longing for escape. That she ignores her constantly ringing phone is our first clue as to what’s going on. As a migrant worker from Kazakhstan, she must dodge authorities and usual channels to gain employment, Dvortsevoy making the accurate point about how our western economies are propped up by migrant workforces and how they are readily exploited, live in disgusting, cramped conditions and pay exorbitant rents for poorly maintained rooms with other people all in the same situation. The director also keeps the camera very close to Ayka, shooting predominantly in medium shots and making striking use of deep-focus, the character and the audience rarely getting any breathing space, and this aesthetic approach produces so much menace and oppression from snow-covered pavements and tall buildings, it’s as if the whole world is going to topple down onto the poor girl. One scene, where Ayka sits down to a hot cup of tea, is the sole moment of comfort and respite she gets throughout the film’s 100 minutes. Ayka exists in the tradition of social-realist dramas, but moves to arthouse rhythms. It isn’t slow at all, Dvortsevoy just wants the viewer to be kept in the dark about his character’s backstory (and why she left her baby alone in hospital) for as long as possible. For this tactic actively invites judgement against her and transgresses the belief women are natural mothers. Once we start to understand Ayka’s life and reasons for behaving how she does, the film gains tragic dimensions and its humanist voice grows into a desperate cry.